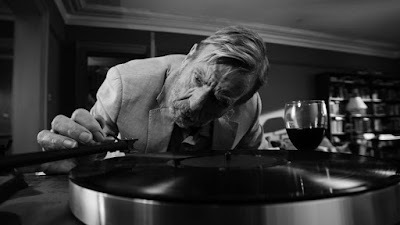 THE PARTY is a brilliantly observed, nastily witty laugh-out loud dark comedy from writer director Sally Potter. Filmed almost as a chamber comedy in one apartment, the entire 70 minute movie takes places over an aborted dinner party. It has been convened to celebrate the fact that Janet (Kristin Scott Thomas) has just become Shadow Health Minister, much to the delight of her scabrously rational realist best friend April (Patricia Clarkson). But, rather bizarrely, her husband (Timothy Spall) is apparently depressed if not borderline potty. This is somewhat overshadowed in the early scenes by the totally bizarre behaviour of the strung out city banker Tom (Cillian Murphy). The remainder of the guests are April's new age hippie boyfriend Gottfired (Bruno Ganz), brilliantly mocked by April - as well as a lesbian couple expecting triplets, Martha (Cherry Jones) and Jinny (Emily Mortimer). It would be unfair to reveal the plot twists and dramatic turns that propel this short film toward its dramatic conclusion. I was utterly surprised by all of them - particularly the last. But it felt to me that this film had it all - properly funny, but also with moments of real relationship trauma and deeply felt distress. In particular, the reaction of Martha to learning she's co-parenting triplets felt very raw and credible. The acting is also universally good, with Patricia Clarkson stealing the show with her nasty put-downs. I also loved Aleksei Rodionov's cinematography - effectively using lighting to create stark black and white contrast, and with a mobility and fluidity that kept this one-room drama feeling exciting and pacy. The music choices are also used to great effect - in one scene of near-death, the use of Dido's Lament had me corpsing too. In the words of Meester Phil, this is a frankly delightful film. It's an unhinged expose of the middle class English suburban family and purported intellectuals. THE PARTY has a running time of 71 minutes. The movie played Berlin, Seoul, Sydney, New Zealand, Melbourne and London 2017. It was released earlier this year in Germany and France.